Electrical engineers, if you had any how was your holidays? Usually children are back to school on September, that’s why we thought it was a ncie idea to publish an article about children and Electrical Engineering. If you’re a parent and looking for an alternative to regular educational toys for your child, this article is for you. Children are naturally curious. As they grow, they ask questions, play with dirt, and build and take apart things in a bid to explore and understand the world around them. Research from the National Institute for Early Education shows that the natural curiosity in children gives them the ability to tackle STEM subject matters. Growing evidence indicates that if children are not introduced to STEM subjects, like electrical engineering, before middle school, they are unlikely to show interest in the subjects. Are you thinking of introducing your child to engineering? Here are 5 reasons why you need to do that soon. Electrical engineering subjects have lots of hands-on Montessori toys and Montessori activities in general that involve working in groups. As children work on their projects together, they ask each other questions like, “what should we do to make this device work?”. These activities teach children teamwork and collaboration, critical and creative thinking, as well as communication. Moreover, electrical engineering teaches them practical modern skills that are essential in the 21st century. Electrical engineering is part of the STEM subjects that require children to apply mathematical and scientific skills, and have fun at the same time. As a result of applying these skills, they gain a better understanding of mathematics and science. Using math and science in electrical engineering also helps children see how these subjects are relevant to their everyday lives, motivating them to work harder and excel in them. Every parent wants their child to do well in school. Children who do not get excellent grades often feel left behind by the top performers. Electrical engineering eradicates the stigma of failure by teaching children that getting things wrong is an integral part of problem-solving and discovering new possibilities. It also motivates them to think outside the box to get better results. Engineering at an early age instils the value that there is no right answer and there are many approaches to a single problem. As a result, children who begin engineering at an early age are more likely to be successful in life and academically. It would be apt to say that electrical engineering is one of the best inventions of humankind. It has advanced continually, and it continues to prove useful to man. As the global population increases, electrical engineering is required to address global challenges and improve the quality of life. Today, the world needs renewable energy to sustain the needs of the modern world. Not to mention, 1.1 billion people still do not have access to electricity. 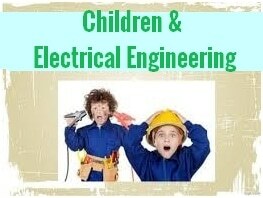 Children who take electrical engineering early are likely to have career interests in this exciting discipline. Even if a child does not take electrical engineering as their career, learning it equips them with skills that apply to any career path. Every workplace in the 21st century looks for employees who can collaborate and communicate effectively with their colleagues. Engineering also helps young ones to view careers as things that they choose to do instead of obligations. To put it in a nutshell, an early introduction into engineering builds more than one skill in children. It encourages them to take up mathematics and science and to make informed decisions. Educational toys can be used to compliment electrical engineering, helping a child learn more practical skills and have fun. What’s your thoughts on this topic? Have you ever introduced a child to Electrical Engineering? How did it go? or copy this trackback: http://engineering.electrical-equipment.org/others/5-reasons-introduce-children-electrical-engineering.html/trackback from your own site. What are the Different Types of Motor control centers?